The UK government published a policy paper this week that attempts to counter unionist concerns about the Withdrawal Agreement and its potential impact on Northern Ireland’s place in the United Kingdom. Underpinning this paper is the government’s commitment to ‘maintain absolutely the principle of consent’. Katy Hayward and David Phinnemore explain the origins and significance of this concept in the contemporary politics of Northern Ireland. They then critique the arguments made against the Withdrawal Agreement purportedly in defence of the ‘principle of consent’ before summarising what the UK government is proposing to do in order to secure consent from Northern Ireland in the outworking of this Agreement and its Protocol. The policy paper on UK government commitments to Northern Ireland and its integral place in the United Kingdom (published 9 January 2019) is a remarkable document. On the one hand, it is a direct assurance to unionists that Brexit, and specifically the Protocol on Ireland/Northern Ireland in the Withdrawal Agreement, poses no threat to the Union. On the other hand, it at least implies that the Union is not to be taken for granted. For, it notes, ‘the Union’ of the United Kingdom ‘will only endure’ with the ‘consent of the people of Northern Ireland’ – and if the government does not listen to ‘the people and communities there who do not want a return to a hard border’ then, to put it bluntly, they are less likely to support the Union (paragraph 4). This is particularly interesting because the principle of consent has traditionally been seen as a tenet of the 1998 Agreement intended to reassure unionists, the assumption being that the unionist view in Northern Ireland was firmly that of the majority. The UK policy paper hints at an interesting alternative prospect in light of Brexit: that this unionist majority is likely to dissipate if Brexit results in a hard Irish border or severe disruption to daily life in Northern Ireland. As such, the policy paper is intended to show that the best possible protection of the Union is to be found in the Withdrawal Agreement, with its Protocol that seeks to both avoid a hard border and uphold the principle of consent. Not everybody is convinced, however. 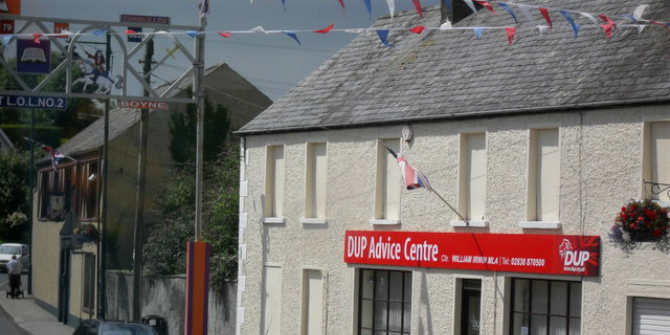 The Democratic Unionist Party (DUP) has been vocal in its concerns that the Withdrawal Agreement poses dire risks to Northern Ireland’s constitutional status. Additionally, in a recent Policy Exchange paper with a foreword from former First Minister and Ulster Unionist Party leader David Trimble, Graham Gudgin and Ray Bassett maintain that the terms of withdrawal are a ‘threat’ to the principle of consent as set out in the 1998 Agreement. In making the argument that it does so, however, we contend there are misguided assumptions both about the 1998 Agreement’s requirements for consent and about the terms of withdrawal that the UK and the EU have agreed. Consent, by definition, is ‘permission for something to happen’. In a private, personal context it is a powerful defence against unwanted actions by another. In politics, popular consent is normally channelled through democratic institutions and procedures. Politicians and civic leaders rarely call for the people to decide on actual policies or laws. There is no need for popular ‘permission-giving’; elected representatives take on responsibility for making decisions on behalf of their constituents. The inclusion of requirements for specific defined ‘consent’ in the 1998 Agreement is, therefore, notable. It is important to acknowledge that this is not defined in the text as a ‘principle’ per se. Also, it should be noted that it comes in two forms. The first and most-often referred to form is in relation to the need for majority consent within Northern Ireland for change to its constitutional status. Article 1 of the 1998 Agreement states that the right of self-determination for ‘the people of the island of Ireland alone’ is to be exercised ‘on the basis of consent’. This is immediately referred to as being ‘the consent of a majority of the people in Northern Ireland’. The Northern Ireland Act 1998 sets out how this permission is to be determined. Northern Ireland ‘shall not cease’ in its entirety to be part of the UK ‘without the consent of a majority of the people of Northern Ireland voting in a poll held for the purposes’. The amendments to the Irish constitution arising from the 1998 Agreement also confirm that consent of a majority of people in both jurisdictions has to be ‘democratically expressed’ for any such change. It remains indisputably the case that Northern Ireland’s constitutional status can only be changed via a referendum, or so-called ‘border poll’, in line with the 1998 Agreement. The second form of consent concerns voting in the Northern Ireland Assembly. According to the requirement for ‘parallel consent’, a majority from each group of those MLAs designated as unionist and as nationalist is required to approve important legislation (e.g. on financial matters) and decisions (e.g. the appointment of the Speaker). This version of consent is quite different to the one relating to the first version noted above in that it seeks the consent from both ‘sides’ of the Assembly – that is, unionist and nationalist – and specifically not a simple majority of those in the Assembly. It was as clear then as it is now that Northern Ireland’s constitutional status as a part of the UK is not directly affected by the UK withdrawing from the EU. Northern Ireland remains part of the UK, and this is confirmed in Article 1 of the Withdrawal Agreement: ‘This Agreement sets out the arrangements for the withdrawal of the United Kingdom of Great Britain and Northern Ireland (“United Kingdom”) from the European Union’. For some (such as Gudgin and Bassett) the specific arrangements for Northern Ireland contained the Protocol on Ireland/Northern Ireland in the Withdrawal Agreement, and the potential for its ‘backstop’ provisions to come into force, offend against the principle of consent. They claim that the Withdrawal Agreement threatens the constitutional integrity of and Northern Ireland’s position in the UK. This argument is one that has been made forcefully by members of the DUP since the Withdrawal Agreement text was published on 14 November, and it has informed their opposition to it – to such a degree that they look set to vote against it next week (if it does indeed come to a vote in the House of Commons then). We can identify the arguments that view the Withdrawal Agreement as a breach of the principle of consent under five broad themes, which we will address in turn. At one level, the concerns behind some of the claims about the principle of consent have less to do with the constitutional status of Northern Ireland as a part of the UK and more to do with the sense that arrangements are not sufficiently ‘British’. This, however, is difficult to marry with the fundamental principles of the 1998 Agreement itself which provides formal recognition of the importance of the Irish dimension – in citizenship, identity, political aspirations – alongside those of the British dimension within Northern Ireland. Maintaining this hard-won and carefully poised balance is, after all, a core reason as to why Brexit has posed such a challenge to negotiators in providing for the Northern Ireland dimension, and why there is a need for a dedicated Protocol on Ireland/Northern Ireland in the Withdrawal Agreement. Regarding specific claims that the principle of consent is threatened by the terms of the Withdrawal Agreement, we see that many relate to the operation of the devolved institutions. The assumption is that any arrangement affecting Northern Ireland should only be agreed by the UK and the EU in line with the principle of parallel consent, i.e. that it has unionist and nationalist support. Although such a suggestion might be made in the political sphere, as a matter of law, parallel consent formally only applies to the passing of certain devolved legislation. The UK’s relationship with the EU is an “excepted matter” in the Northern Ireland Act 1998, which is the constitution for devolved government in Northern Ireland, and is therefore outside the remit of the Northern Ireland Executive and Assembly. On closer examination, we see that the deepest concerns relate to the Protocol’s purpose to protect North-South cooperation as it currently functions. The Policy Exchange paper authored by Gudgin and Bassett also claims that the ‘principle of consent’ is required for the North-South institutions for cross-border cooperation to function. No legal provision of the 1998 Agreement is called in aid to support this claim, which goes well beyond what is stated in its paragraph 12 provision. The Gudgin-Bassett proposal would bring to a halt longstanding arrangements, already agreed and in operation, without having any apparent legal authority for doing so. Related to this, Gudgin and Bassett also criticise the list of areas for continued North-South cooperation, claiming that ‘[n]ot much it seems would escape the tentacles of the protocol’. They overlook the fact that the 14 areas listed in the Withdrawal Agreement are those of existing cooperation either ‘agreed by the North-South Ministerial Council’ or ‘developed in line with the principles of North-South cooperation laid down in the  Agreement’. This list was drawn up by UK civil servants as part of a mapping exercise of North-South cooperation. Another argument on the basis of consent against the Withdrawal Agreement made by Gudgin and Bassett is that ‘any further development of North-South cooperation arrangements’ (emphasis added) can only come about with the specific endorsement of the Northern Ireland Assembly and the Oireachtas. This, indeed, is a concern that is directly addressed in the UK government policy paper of 9 January in its assurance that there will be ‘no expansion of North-South cooperation without the cross-community consent requirements set out in that Agreement.’ (paragraph 47). The interpretation of ‘further development’ or ‘expansion’ of North-South cooperation is curious, given that the purpose of the Protocol’s implementation and application is ‘to maintain the necessary conditions for continued North-South cooperation’ (emphasis added). [Indeed this is also noted in paragraph 32 of the policy paper] Consent for such cooperation has already been given by the Northern Ireland Assembly. The assumption behind this Protocol provision is that the ‘conditions’ for North-South cooperation has been the common basis of EU law in both jurisdictions. Rather than allowing for or anticipating its expansion, this Protocol provision is intended to preserve North-South cooperation regardless of the changing relationship between the UK and EU. With this in mind, the UK government’s point in paragraph 47 regarding cross-community consent could be seen to be an effort to reassure unionists, above and beyond what might reasonably be anticipated to arise from the Protocol in practice. Finally, claims are made that the ‘principle of consent’ would be breached through the continued application of EU law in Northern Ireland. It is difficult to see any legal foundation for this claim in the two versions of consent in the 1998 Agreement. If a requirement for consent to the continued application of EU law in Northern Ireland were to be accepted, as Gudgin and Bassett suggest, then it would follow that the prior act of deciding to leave the EU should be seen as at least as disruptive to the operation of the 1998 Agreement. As has been extensively argued, shared UK and Irish membership of the EU is assumed in the 1998 Agreement; it also contains specific references to cooperation in the sphere of EU law sphere. It follows from the reasoning of the Policy Exchange paper that the Assembly should have – or have had – some consent-giving role on the decision to trigger Article 50, notably in the light of the 56% vote in Northern Ireland for the UK to remain in the EU. It is for the UK government – and not the UK Parliament or the devolved institutions – to determine foreign policy and negotiate the UK’s international agreements. To make those subject to the principle of parallel consent in the Northern Ireland Assembly would be tantamount to a portion of the Assembly assuming the power of veto over the outcome of international negotiations undertaken by the UK government. That the Protocol on Ireland/Northern Ireland includes the potential for distinct arrangements for Northern Ireland if the backstop comes into force is not disputed. Differentiated governance arrangements within the UK are hardly unprecedented as long-standing differences between legal systems, policy-making processes, laws and policies testify. The principle and practice of devolution has only reinforced difference within the UK and demonstrated the extremely flexible nature – evident too in its accommodation of the 1998 Agreement – of the UK constitution. However, how such differentiation is managed is important – and the mechanisms of devolution inevitably come to the fore in addressing concerns about ‘consent’ and representation in such a scenarios. The 9 January policy paper is an effort to reassure in this regard, without going beyond the specific and limited definition of the principle of consent vis-a vis constitutional status (as spelled out above). It contains four main assurances about consent from Northern Ireland, broadly defined. First, the government promises a ‘strong role’ and ‘strong voice’ for the Northern Ireland Assembly and Executive both before the backstop decision is made and during any implementation of the backstop. More generally, the policy paper presents the distinct arrangements for Northern Ireland arising from the Protocol as offering “An enhanced role for Stormont in boosting the Northern Ireland economy”. It notes that the ‘small fraction of Single Market legislation’ that would apply to Northern Ireland would actually mean ‘significantly increased powers and flexibility for a restored Northern Ireland Assembly to enact laws on a wide range of devolved areas currently governed by EU law’ (paragraph 40). The paper describes Stormont’s role as being to ‘consider new approaches and options’ arising from this legislation, rather than having the power to veto it (paragraph 41). It is vital that a stronger role for Stormont is not seen here in isolation but is connected to the government commitments here to ‘strengthening the powers’ of all the devolved administrations, including in Scotland and Wales, as part of a ‘new chapter for devolution in the United Kingdom’ (paragraph 42). In so doing, this underlines the opportunity to strengthen the Union through the management of Brexit, rather than to weaken it (as would likely occur through centralising processes, as many have pointed out). Secondly, the government is offering to ‘provide in law for a mandatory process of consultation with the Northern Ireland Assembly’ over whether the backstop would come into force or whether the transition period would be extended (paragraph 18). This would mainly take the form of ‘debating and voting’ and then formulating a view which is then passed onto Westminster for consideration (paragraph 19). A cynic might note that the formulation of a clear singular view from the Northern Ireland Assembly or Executive is difficult at the best of times. This would be on a highly divisive topic and under strict time limits – the consultation with the Assembly would have to be concluded in enough time for Westminster to make the final decision by 1 July 2020. Thirdly, it promises to legislate in domestic law to ensure that a UK Minister will be required to seek agreement of the Northern Ireland Assembly before reaching any agreement in the UK-EU Joint Committee to add additional alignment provisions to the scope of the Protocol’ (paragraph 23). This is about the expansion of the Protocol. As such it is a reiteration of a point from the UK Government Explainer on the Withdrawal Agreement which went beyond the text of the Protocol itself: ‘The UK would ensure an appropriate role for the Northern Ireland Assembly, in line with our commitments, in this situation before agreeing to the addition of any new areas of Union law under the Protocol’ (paragraph 218). Finally, there are some interesting promises in relation to the new bodies of the Withdrawal Agreement. The government commits ‘to agreeing a Memorandum of Understanding with a future Northern Ireland Executive setting out arrangements for the Executive’s role in respect of the Joint Committee, the Specialised Committee and the Joint Consultative Working Group’ (paragraph 27). This is only to apply to Northern Ireland specific issues. It notes that the UK’s presence in the Joint Committee offers an opportunity for representation from Northern Ireland when issues specific to the region or Protocol are in consideration. This seems a move in the right direction when it comes to making the most of the unilateral capacity of the UK government to involve Northern Ireland given that it is for the UK itself to determine its position and representation in the Joint Committee, Specialised Committees and Joint Consultative Working Group. Consent in Northern Ireland is not a sacred principle but a legal requirement that is carefully limited to a border poll on Irish unification and key decisions in adopting devolved legislation. Neither of these in themselves would be automatically breached by the implementation of the Withdrawal Agreement or the ‘backstop’ arrangements it provides for. That said, the broad acceptance and long term stability of the Withdrawal Agreement surely requires proper consideration of the need for democratic representation and consensus-building at devolved level across the UK, and especially in Northern Ireland. The UK policy paper makes substantive suggestions as to how this might be achieved, drawing on its capacity for unilateral action to enhance devolved governance and building largely on existing democratic mechanisms. In so doing, it could be but a starting point for wider discussions that need to be had about democratic processes, representation and consent across the UK after Brexit. Note: This article is provided by our sister site, LSE Brexit. It gives the views of the author, not the position of EUROPP – European Politics and Policy or the London School of Economics. Katy Hayward is a Lecturer in Sociology at Queen’s University Belfast. David Phinnemore is Professor of European Politics in the School of History, Anthropology, Philosophy and Politics at Queen’s University Belfast.